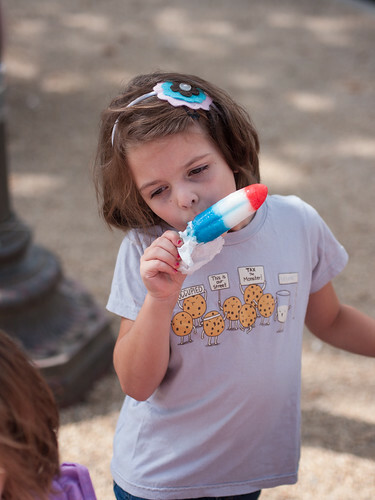 Leah's preschool had a Back-to-School picnic at a nearby park. 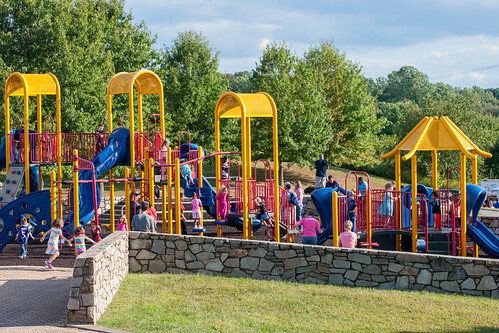 The playground was packed the entire time, giving the kids lots of practice at taking turns. La Pearl Waffles came to the picnic. While Chad waited for them to fix our waffles, Leah and I relaxed on the hillside. 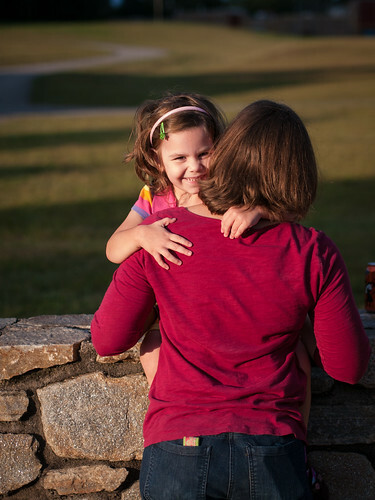 Leah loves to give great hugs! 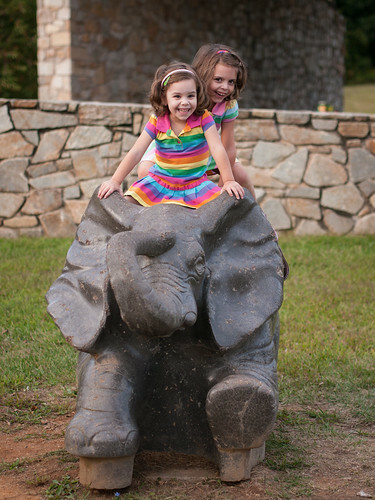 The girls had a lot of fun playing on this elephant. They said they were riding it to Alabama. Chad told them that this would not be a very speedy form of transportation, but they felt that the journey was just as important as the destination. 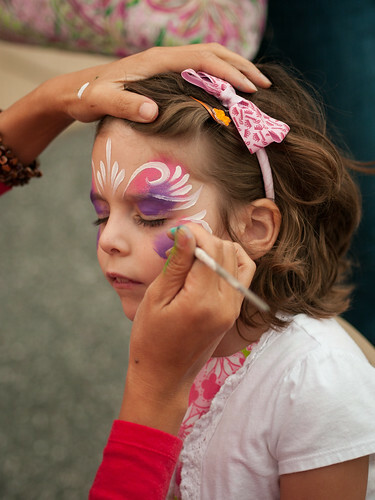 Back-to-School picnic #2 was Molly's, which included some outstanding face painting. Molly went for the full face look. 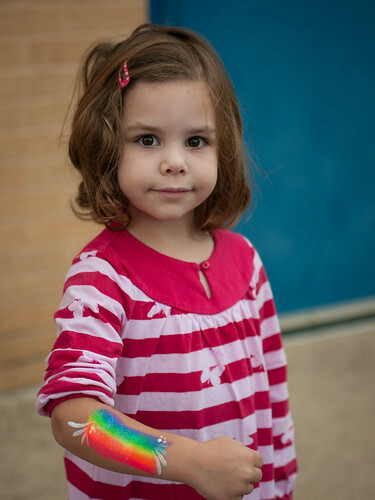 Leah opted to have her arm painted instead of her face. I rarely sew for myself as sewing for the girls always seems to take the priority. So, when I saw this post on Selfish Sewing Week, I knew that it was my motivation to make one of the dresses for me that has been on my to-do list for over a year. 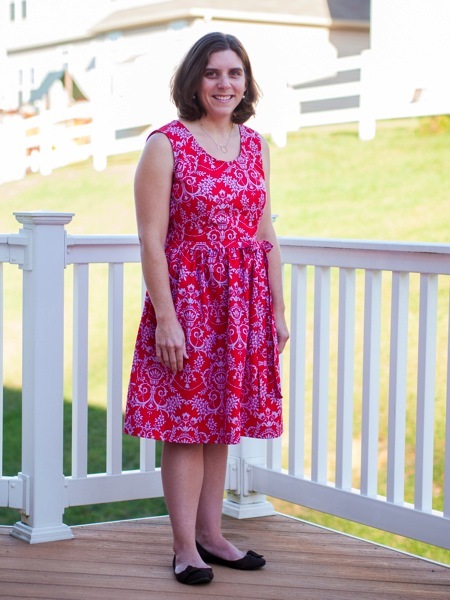 Edit: My dress was featured on the Imagine Gnats Selfish Sewing recap for today. What a huge compliment! 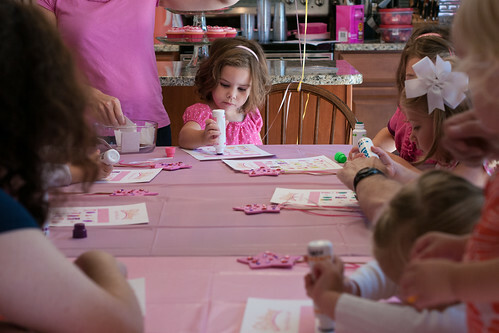 When Leah requested a Pinkalicious party for her 4th birthday, she and Molly also requested dresses made by Mom. 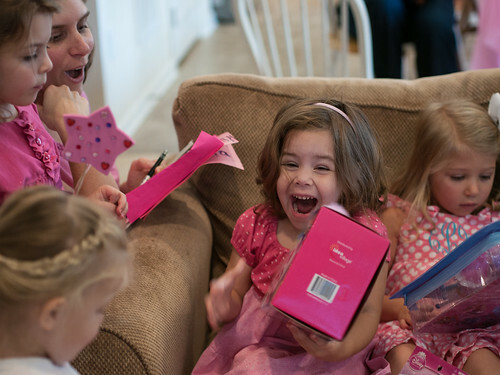 The girls looked through their Pinkalicious books and picked out the dresses to replicate. 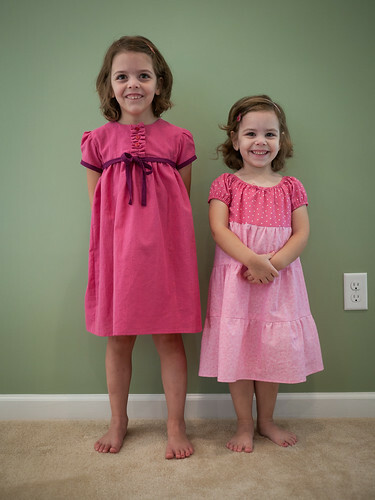 Leah's dress is inspired by the classic Pinkalicious dress, while Molly's is inspired by the nightgown in Silverlicious. 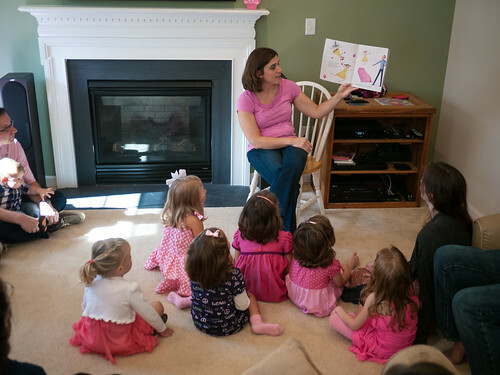 A Pinkalicious party must include a reading of the original Pinkalicious book. 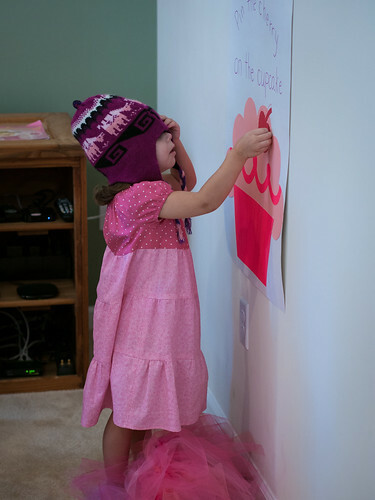 Leah didn't care for all of our cries of "no peeking" when playing Pin the Cherry on the Cupcake. 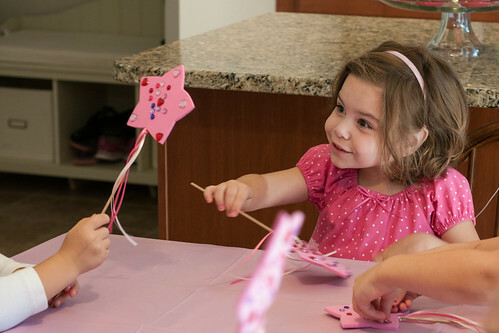 The girls decorated pink wands. And then played Pinkalicious Bingo. Aunt EA and Uncle Scott continued their tradition of cards including audio. And like before, it's a favorite. Someone else took a video of the same card, if you're interested in what it is. All eyes on Leah. Well, except JJ. Leah's wanted some Stompeez ever since Molly got a pair, so she was very excited to get this pair. She actually ended up getting two different pairs for her birthday, and she loves them both. 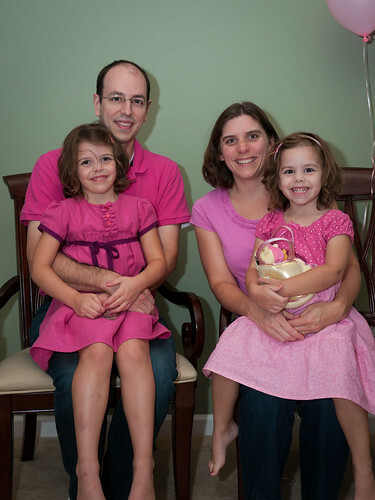 We all wore pink for the occasion - even Chad! JJ made sure Pinkalicious's little brother, Peter, was represented. 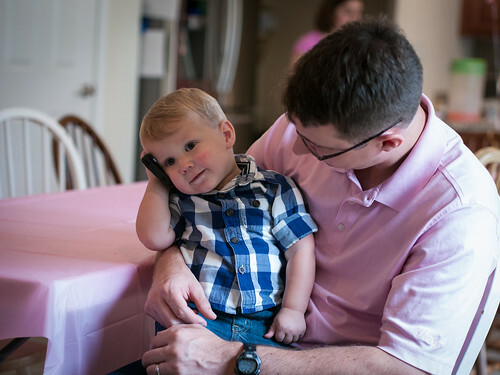 Apparently JJ had an important call to make (or maybe it's that he loves listening to his daddy's music!). 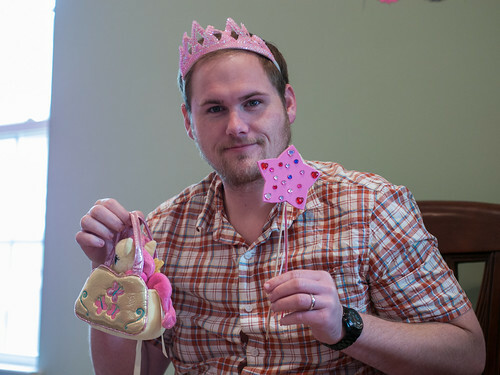 The My Little Pony purse and wand are just Uncle Scott's size. 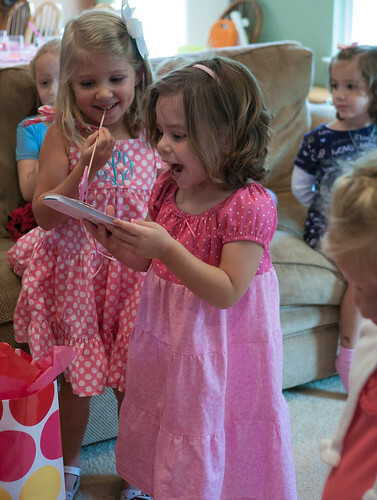 The morning of her actual birthday meant more presents - this time from our Alabama visitors. 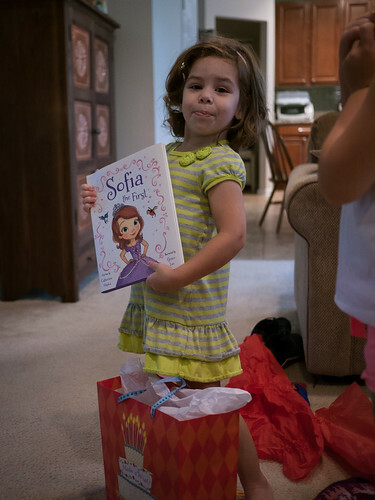 Leah is the very proud owner of this Sofia the First book. 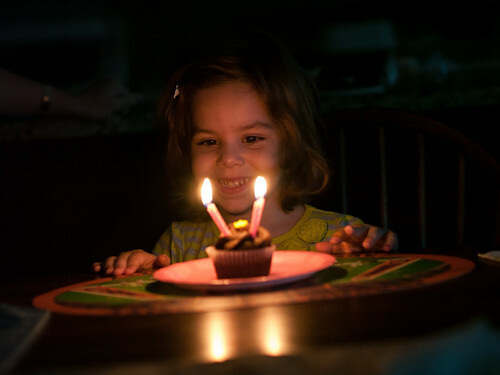 She requested a fancy 4th birthday dinner: grilled cheese sandwiches and cupcakes from Oh, What a Cake! It was nice to have quiet dinner after a busy birthday weekend. 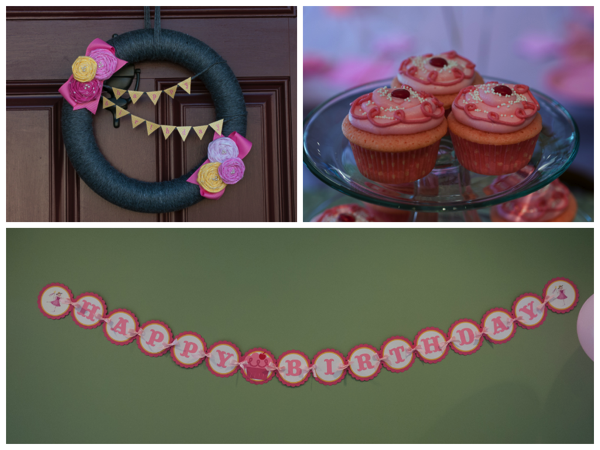 You can see all the pictures from the birthday weekend on Flickr. After spending the week in New York, G'Mom and Grampa joined us back in Maryland. 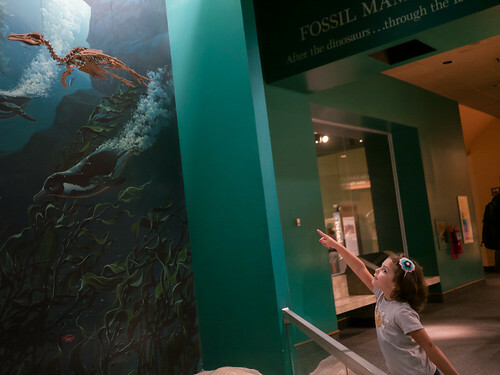 We decided to take a trip down to the Smithsonian Natural History Museum. 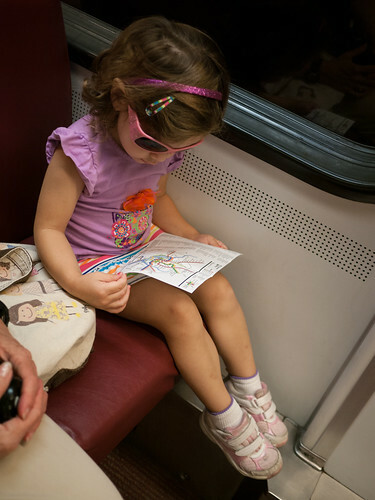 And to get there, we had to take the fun route of riding the DC Metro. 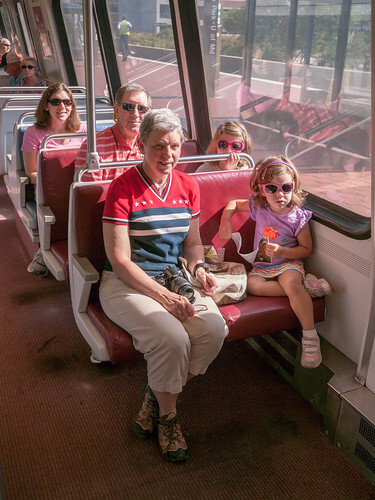 This was actually the girls' first ride on the Metro. Leah studies the subway map carefully. Not sure how she's seeing it with her sunglasses on while we're underground. 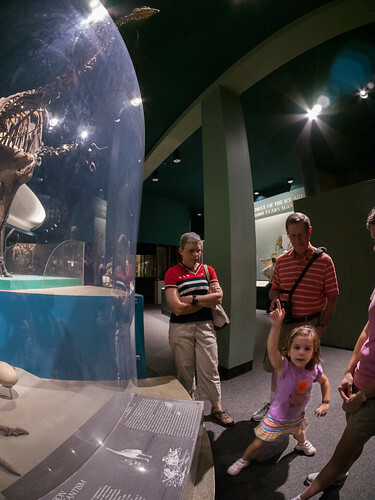 We thought of making this trip because Molly's been asking to see dinosaur bones. 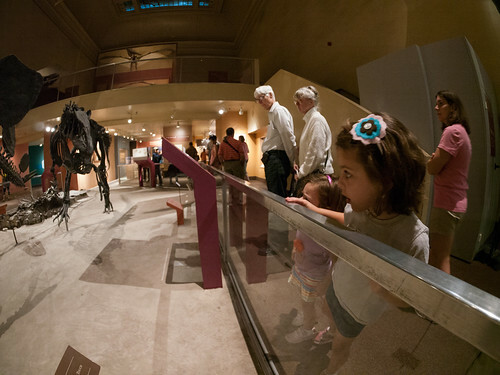 Well, now she can see them, but I think this allosaurus is staring right back at her. 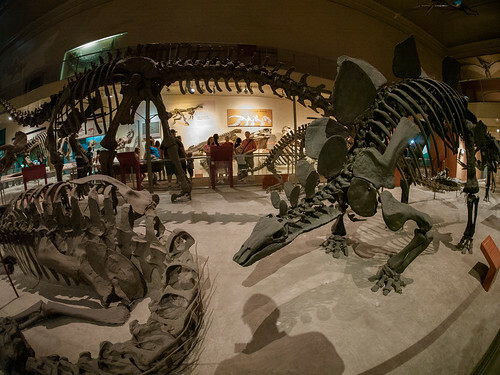 Some of the dinosaurs were very big. 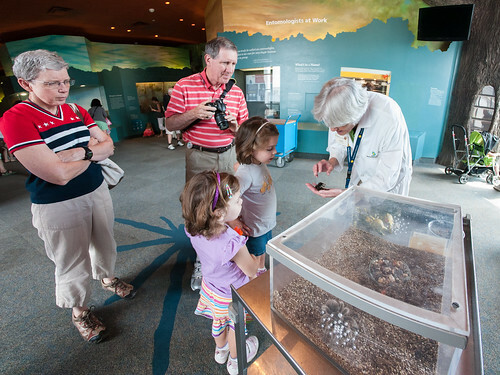 Those tiny figures under that tail are Molly, me, Grampa, and G'Mom. Look. Up there. Swimming dinosaurs. Look, Dad, look. Big prehistoric birds. 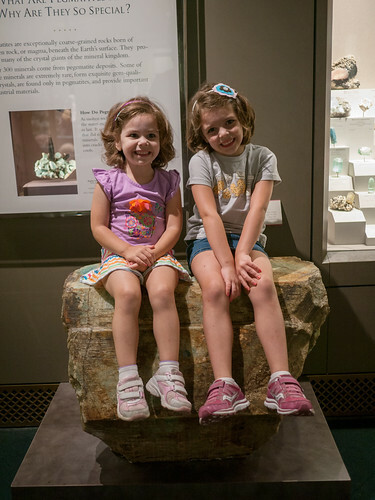 They had a hands-on area for kids to play with archeology-related things. 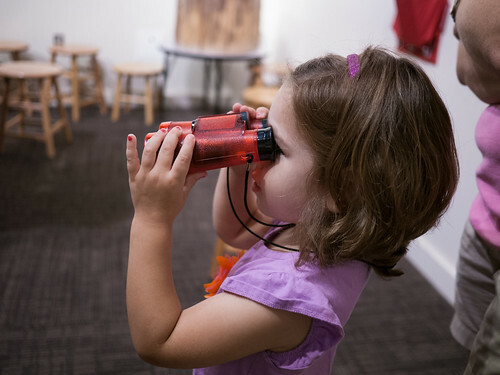 Leah was a big fan of the binoculars. 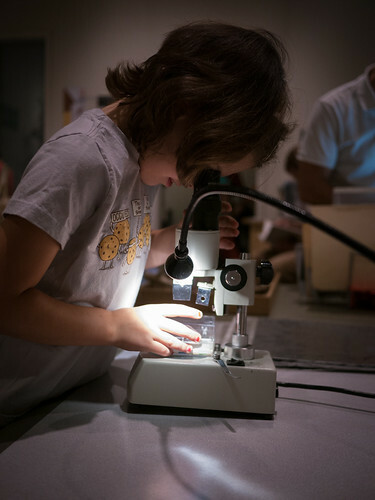 They had a few microscopes that the kids could use to look at fossils up close. 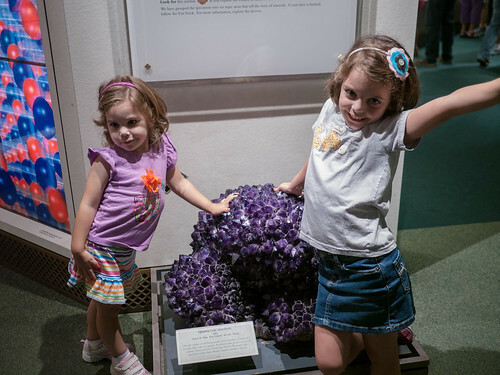 There were some things (like this rock) in the main exhibits that said kids could touch them. 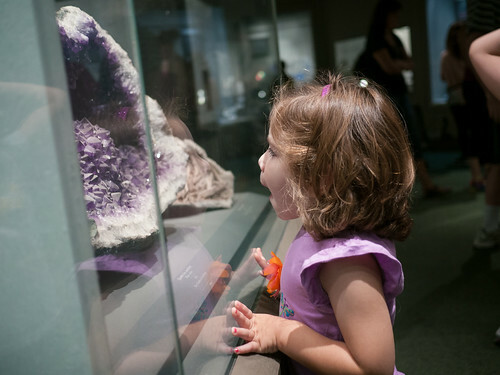 This rock in the gemstones exhibit made a good seat. Lots of shiny things. 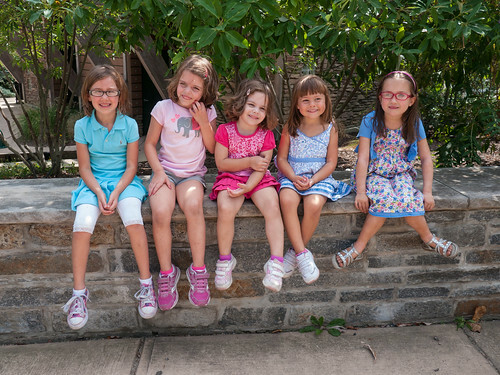 Naturally, pink and purple things were favorites of the girls. Purple. And you could touch it, too. 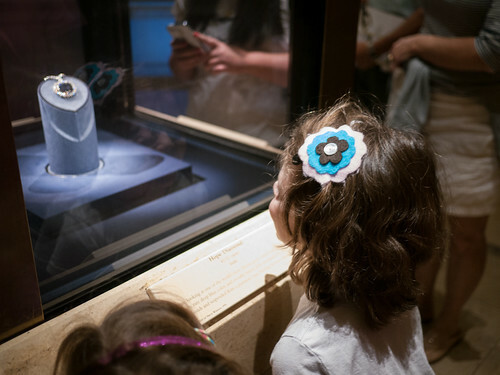 The girls got to see the Hope Diamond up close and personal. 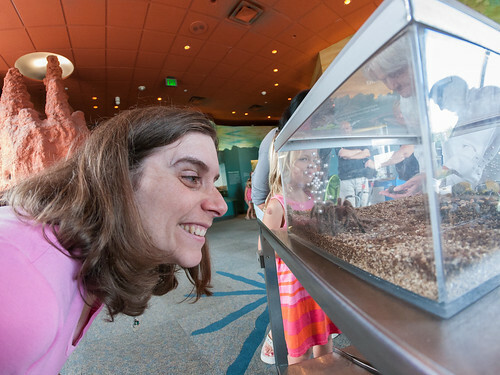 In the Insect exhibit, the girls got to see a tarantula. 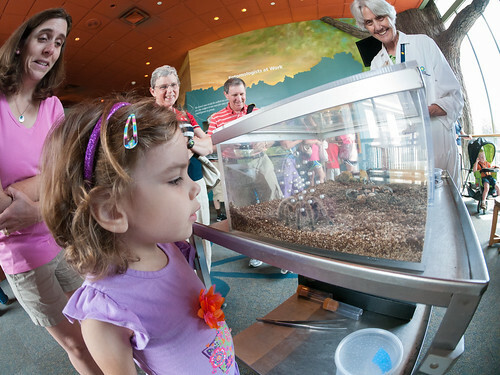 Leah wasn't scared of the hairy spider at all, putting her face right next to the glass. I had a slightly different reaction. After the bravery of my daughter, I got up close with the spider as well. 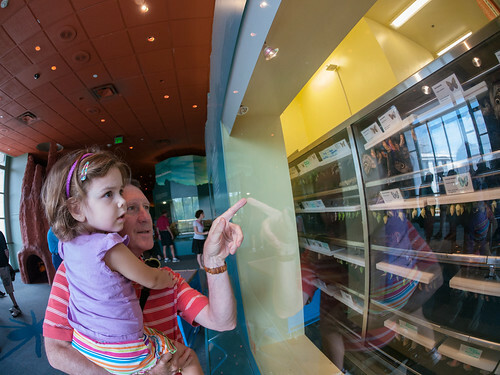 Grampa and Leah check out all the butterflies starting to emerge from their chrysalides. 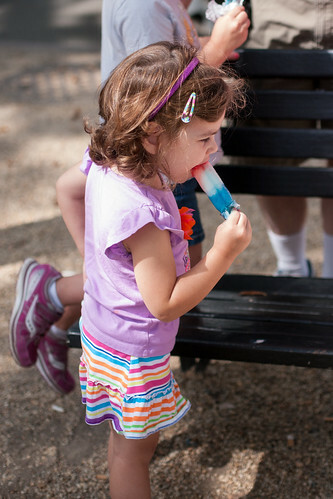 After the museum, the girls got some popsicles on the national mall. They made a mess, but enjoyed them thoroughly. 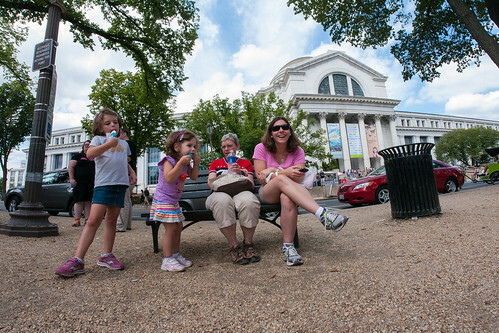 Snacking on the mall with the museum in the background. 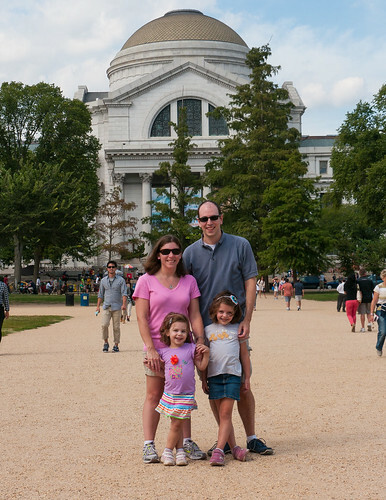 Here we are, after a very fun trip to the museum, with the dome of the museum in the background. 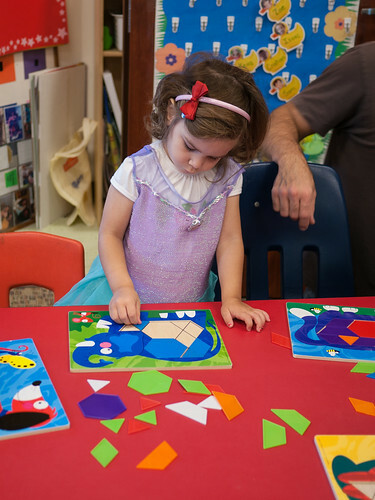 It's now Leah's turn to attend East Columbia Preschool. 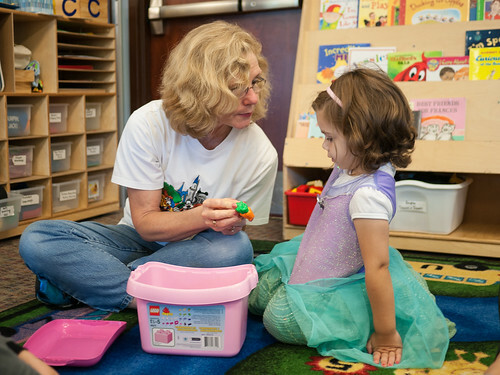 She visited the classroom the Friday before school started. No surprise, she went straight to the dress-up and wore this Ariel dress the entire visit. Leah was sweet to ask Miss Carol to take a picture with her. 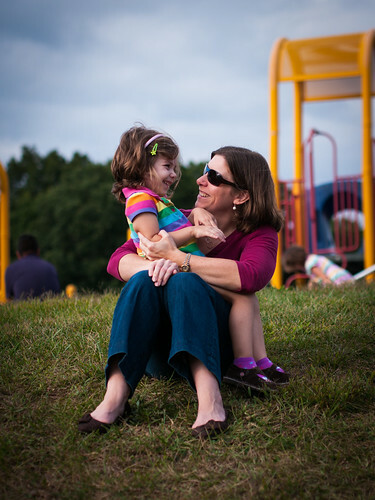 We are excited to be back at ECP after a year hiatus. 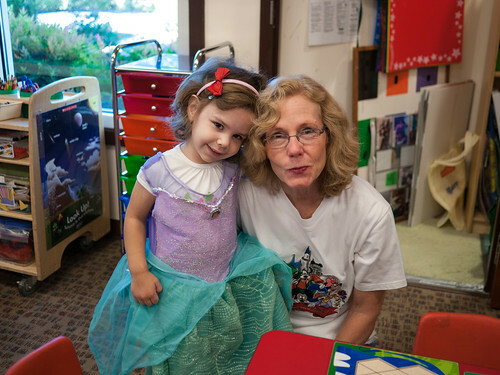 Miss Carol is thrilled to finally have Leah in her class. 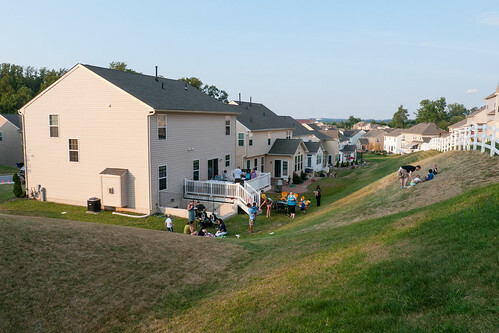 I am the class coordinator for Leah's class, so we hosted a Back to School BBQ for the class at our house. 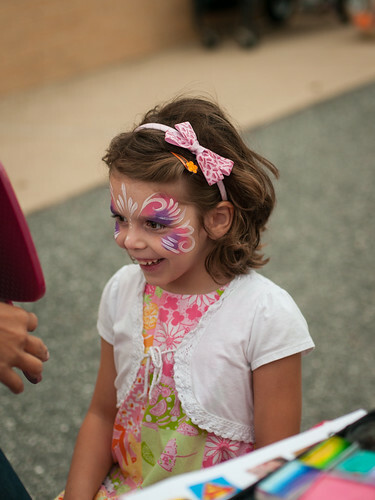 To our surprise, we had about 60 people come (24 adults, 36 kids). 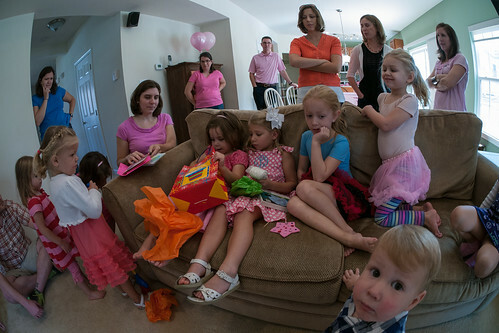 The party was definitely a hit. The weather was great, which we were very thankful for as I don't think we could have fit everyone inside. 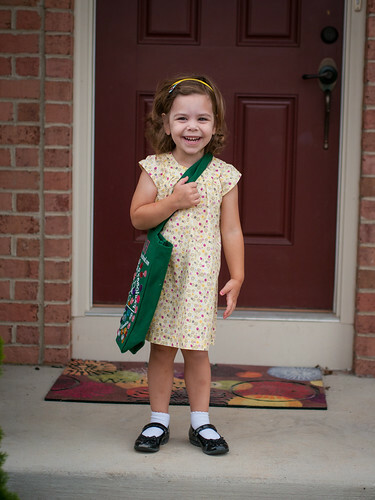 Then finally, last Tuesday was Leah's first day of school. She was ready! 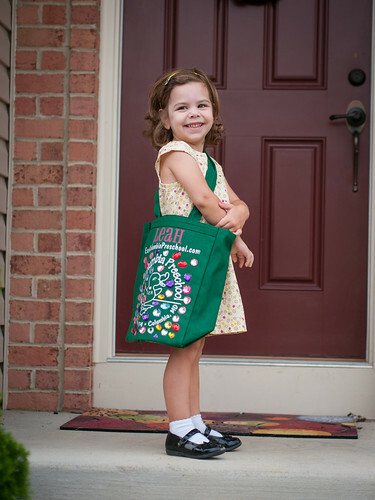 When I asked how she wanted to decorate her duck bag, Leah said she wanted lots of jewels. Looks like she got her wish. 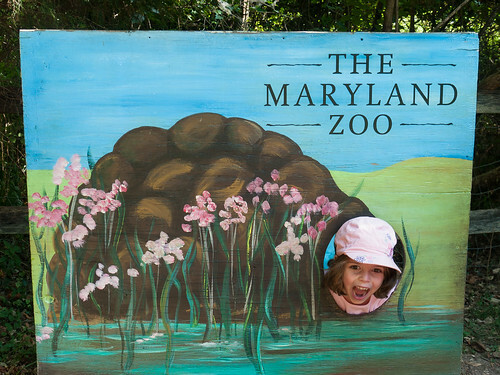 The girls and I joined some friends at The Maryland Zoo in Baltimore. School was closed that day, so the big girls were able to join in the fun too. 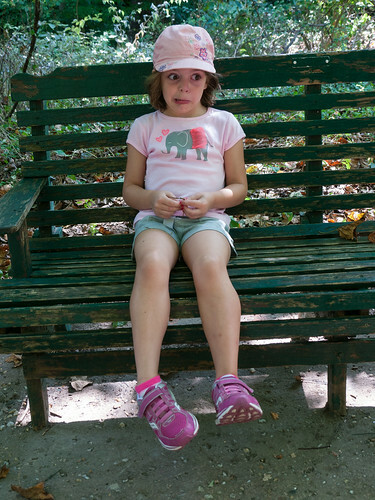 While waiting for her friends to exit a cave, Molly practiced some crazy faces. She's gotten a bit bigger than the last time she took this picture. 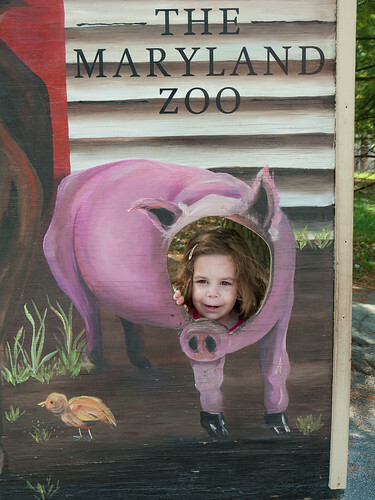 Leah had to practice her oinking while posing as a cute little piggy. 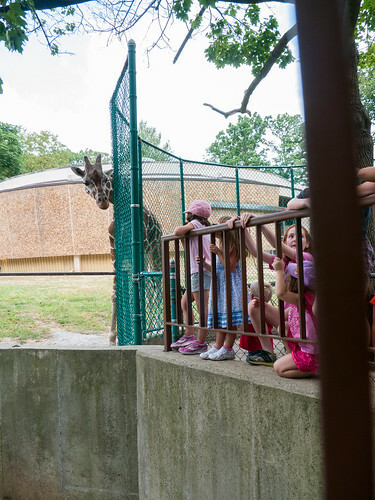 As the kids were checking out the giraffes, this one decided to poke his head around and check out the kids! 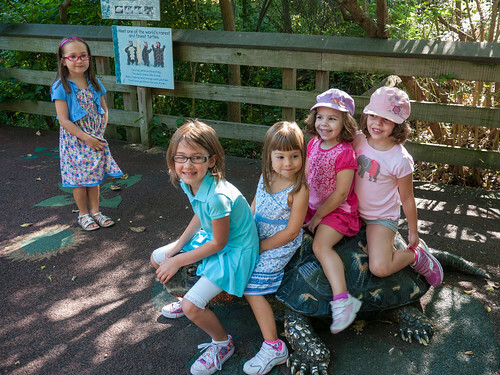 Smiles at the end of a good visit to the Zoo. 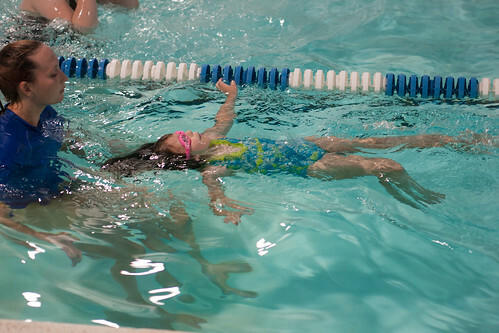 As we talked about earlier, Molly has continued to be hesitant around water, so we enrolled her in a swim school specializing in helping kids with anxiety issues. They were fantastic. Before starting, Molly wouldn't put her face in the water. After 8 lessons, she's like a different girl. 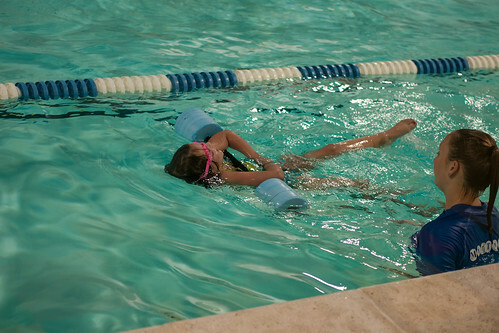 Now, Molly does 10 or 20 bobs (going under water all the way) in a single lesson. She even had a short burst of swimming by herself. Floating on her back. I think this was the first time she'd done this. She's still a little scared of jumping in, but she did it without any trouble. 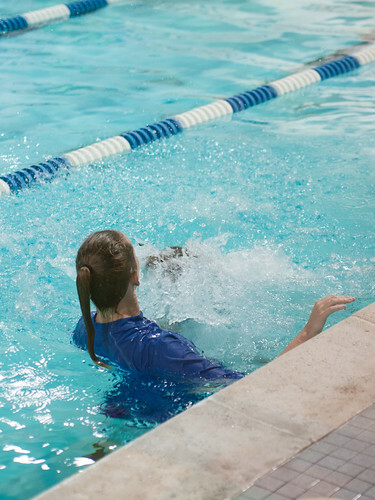 Here she is preparing to dive in, which is still a bit scary but she's done it a couple times. There she goes. Nice dive! 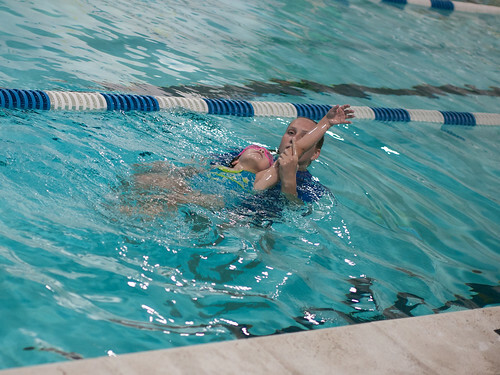 We cannot say enough good things about MarTar Swim School. Molly made remarkable progress in her 8 weeks. We'll definitely be back in the Spring to prepare her for spending the Summer at the pool! 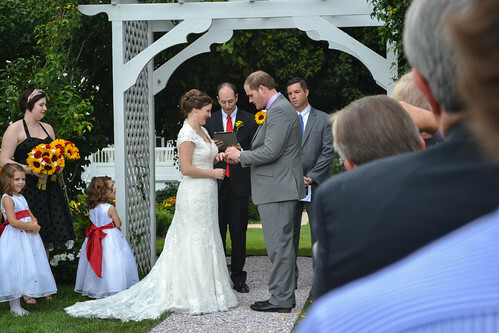 We had a wonderful weekend celebrating the wedding of Elizabeth and Scott. 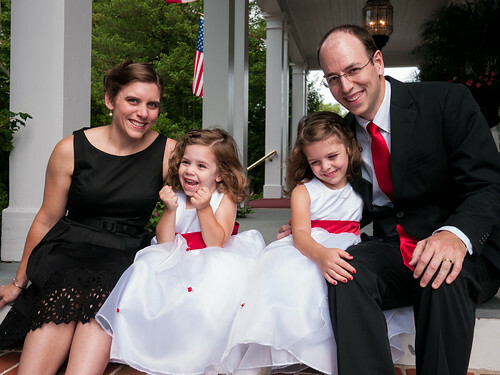 Our entire little family participated in the wedding. Chad took many, many photos and thanks to my Dad, we have some pictures from the ceremony too. Here are some of my favorites. 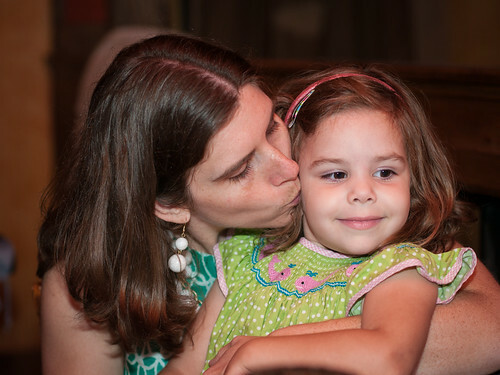 Mommy love at the rehearsal dinner. The morning of the wedding was a beautiful day on a beautiful estate. On the way to breakfast, we stopped by a gazebo to relax a bit. 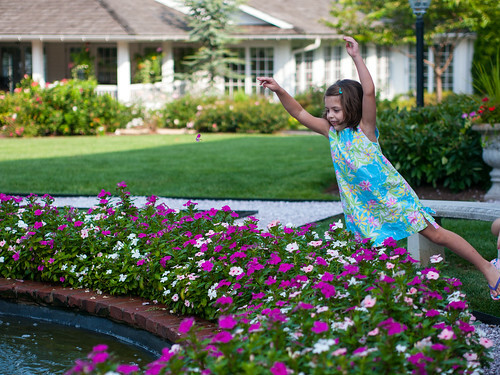 Flower toss. I hear this event may be added to the 2016 Olympics. 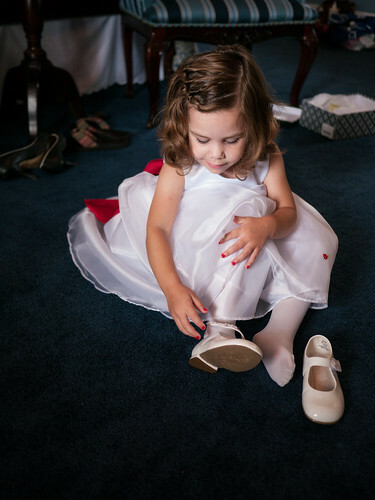 Leah has not been allowed to wear these white patent leather shoes before now, so she was very excited to be able to put them on. We're all ready! 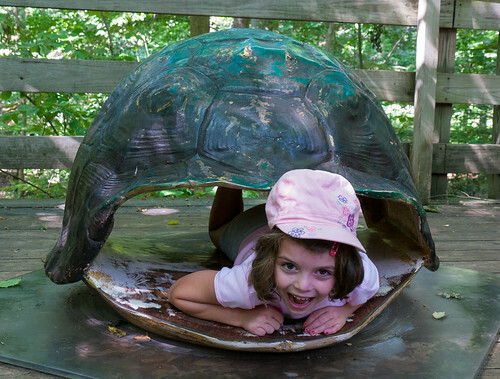 Not sure what Leah's excited about here, but she sure is cute. Molly had been asking all day when the dancing would start. She was disappointed that we had to eat dinner first before the dancing began at the reception. So, of course, she was ready to get out on the floor as soon as we could. 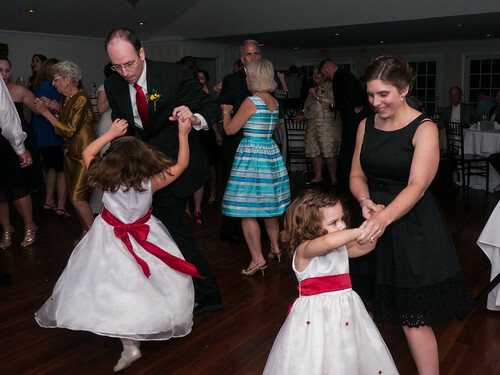 The girls couldn't resist the opportunity to dance with Aunt EA and Uncle Scott. 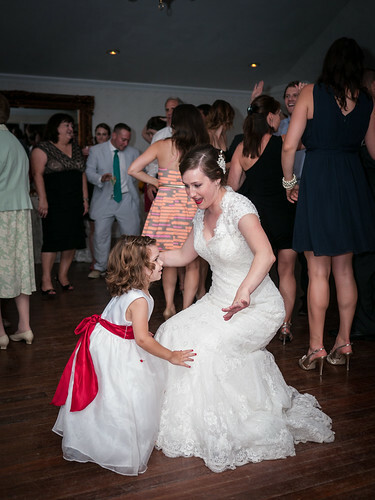 Leah was dancing with Aunt EA to an oldie, when the DJ changed the song to a newer hip hop song. 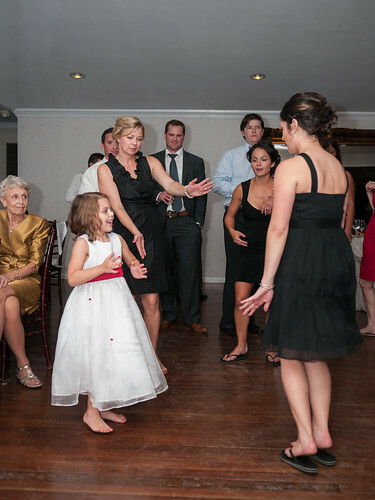 EA put out her arms and dipped low, and Leah didn't miss a beat before matching Aunt EA's new dance. It was adorable. Leah took some breaks, but Molly couldn't get enough dancing. 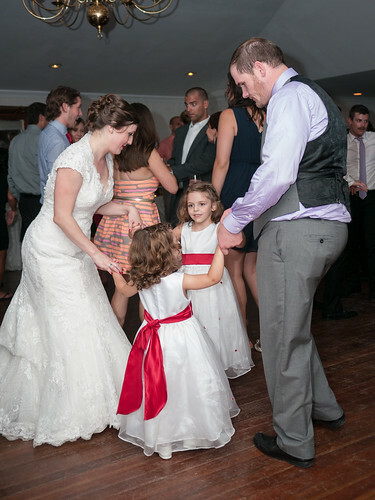 Eventually she was adopted by the bridesmaids as part of their dance circle, which she loved. Molly made it all the way through the reception (including the last song), but Leah couldn't quite make it. 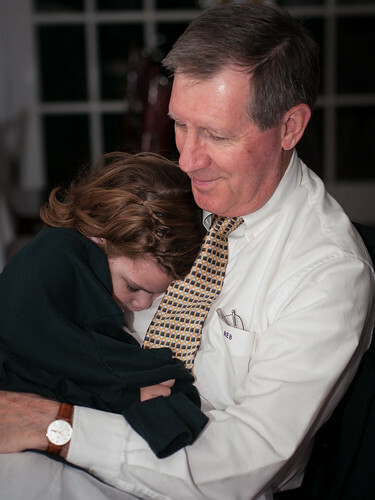 She tuckered out on Grampa toward the end of the reception. 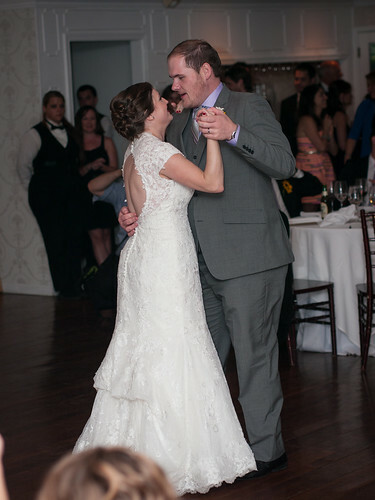 You can see all our pictures from the wedding weekend on Flickr.